Located in Georgetown is Precision Paintball. They are an outdoor facility with lots of great amenities for parties. Their prices for everything from field fees and gear rental to paint and memberships are fair and affordable. Their hours are a little inconsistent, but they have open play most Sundays. Other days of the week are open by reservation. Their fields are all surrounded with netting, so it’s great for spectators as well! They also have a mobile shooting range, which is a lot of fun. The hazards in their fields are pretty fun. Bunkers, tires, and other cover make for a great game. We highly recommend checking out their membership deal. Overall, a great place to play some paintball. Precision Paintball requires a signed waiver from all players before play. Players under 18 will also need the signature of a parent or guardian. The waiver can be signed electronically on their website. Maple Shade Farm Paintball in Townsend is an awesome paintball park. They have more than five playing fields, including woodsball and a target gallery. Plus their fields are lit so the game doesn’t have to end just because it’s dark. They’re open Wednesday through Sunday for glorious paintball and airsoft action. Maple Shade Farm Paintball is a field paint only park, so plan on buying your paintballs on site. Their field fee and gear rental prices are fair, and their paint prices aren’t bad either, so you don’t have to worry about breaking the bank. They have some good hazards on their fields, including bunkers, a truck, boats, tires, and natural terrain. Honestly though, paintball at night is so much fun, and this is one of the few places you can play after dark. We highly recommend checking Maple Shade Farm Paintball out if you haven’t already. Signed waivers are required of all players prior to play. Players 10-17 years in age must also get the signature of a parent or guardian. The waiver can be downloaded from their website. Just off Porter road in Bear is Mansion House Farm Paintball. They are open weekends only, year-round. They offer several different rental packages, and have discounts for groups as well. They offer traditional paintball as well as Low Impact. Their field and rental gear prices are fair. Mansion House Farm Paintball is a field paint only facility, but their paint prices are also fair, so it’s nothing to worry about. They have three fields: Hyperball Pipe field, Construction Zone field, and Spool City field. The Hyperball Pipe field is especially fun. Mansion House Farm Paintball also occasionally does special events and scenarios, so keep an eye on their events calendar! If you haven’t been here already, definitely make sure to check it out! Mansion House Farm Paintball requires signed waivers for all players. Players under 18 must also get the signature of a parent or guardian. The waiver can be printed from their website, or you can also submit it electronically. 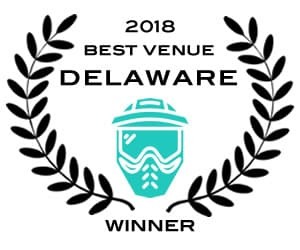 Paintball Action Games in Newark is the biggest paintball park in Delaware, with over 50 acres of fields for playing. They have four monstrous woodsball fields and one Hyperball field, plus several different game modes ready to go including Capture the Flag and Sabotage. Their fields have a great mix of natural and man-made hazards. We especially dig the complex and varied Black & Blue field. If you appreciate rougher terrain and a little extra challenge, definitely check that out. They offer discounts for groups, and for paying in cash! So if you want an already affordable paintball experience to be even more affordable, plan ahead and pay in cash. Overall a really great paintball park, and one we recommend visiting. All players must sign a waiver before playing. Players under 18 must also get the signature of a parent or guardian. The waiver is available for download on their website. A2Z Paintball is a nice paintball facility located in Newark. They have three netted woodsball fields for play. One of their fields is a hybrid Hyperball-Woodsball field with pipes and spools, which is a lot of fun. If you’re into woodsball this is a great place. Their field and gear rental feeds are fair, and while this isn’t a field paint only park, they do charge an up-charge if you bring your own paint. For safety reasons, the cheap big box store paintballs are discouraged (they’re often low quality and possibly too old to be dependable). We appreciate their flexibility in allowing outside paint, while also discouraging the use of cheap, possible unsafe paint. It’s a great balance. Overall this is a great park, and offering flexibility and safety for their players. All players must sign a waiver prior to playing at A2Z Paintball. Players under 18 years old must also get the signature of a parent or guardian. The waiver can be downloaded from their website.